Juárez is the “murder capital of the world.” Multiple murders happen every day as warring cartels and street gangs pick off opponents, settle grudges, and misidentify innocent bystanders as targets. Here, extortion and kidnapping are daily occurrences, and almost every business still open has seen at least one shooting. This is the stage for Robert Andrew Powell’s This Love Is Not for Cowards: Salvation and Soccer in Ciudad Juárez. The author moved to the violent Mexican city on the Rio Grande in 2008, despite its rocketing murder rate and declining population. 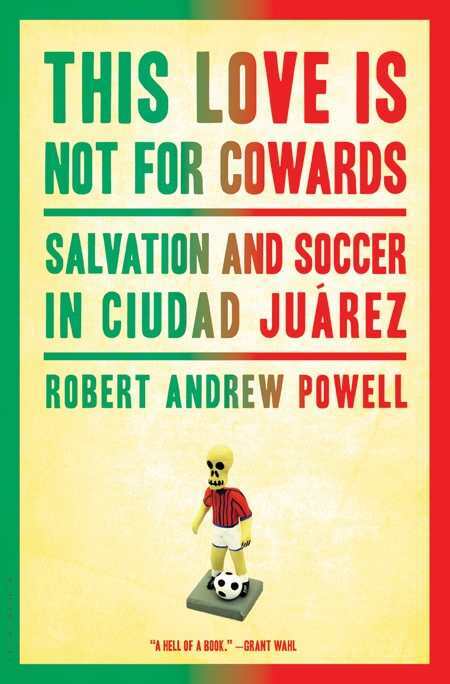 Powell details, in rich, emotional prose, his encounters in the city and beyond, anchoring his tale in the fortunes and failures of a local Primera soccer team: Los Indios. Los Indios is a beloved feature of Juárez, a beacon of light in the endless stream of bad news that fills the papers. Yet even the team, at the time of Powell’s writing, can’t seem to get a break. Before Powell’s eyes, Los Indios loses game after game, sinking in ratings and watching their funding dry up. Meanwhile, the city continues to support the team with strong fan groups and a sense of regional pride, despite the ongoing threat of Juárez’s cartel battles and its corrupt government. Whether the team and its members are a ray of hope or simply the light cast by dying embers cannot be known. Yet Powell weaves a riveting tale of blood, beauty, and even humor, as he follows one team’s relentless pursuit of greatness. He sees that the team inspires its city’s people even in its failing moments. “But it’s becoming clear that there’s a psychic cost to be paid for all the killing, for all the blood we pretend not to see pooling in the streets,” Powell writes. Indeed, the team is no magic pill for the city’s sufferings. It is a marvel that it exists at all, and a miracle that it can distract as it does. This is a story with a dramatic arc as splendid and unpredictable as a striker’s shot on goal. Full of emotion that both simmers and explodes, This Love Is Not for Cowards is, in itself, not a book for the faint of heart.